This pie crust is ideally light and flaky. It works very well for practically any fruit tarte, except — mildly ironically in this context — the walnut tarte for which I made it on Saturday. For that singular tarte, unlike others I usually make in that it is fairly rich, this pie crust is a bit too sweet and buttery. For every other tarte (or even pumpkin pie), it is excellent. It is the galette dough recipe from Chez Panisse Café Cookbook. 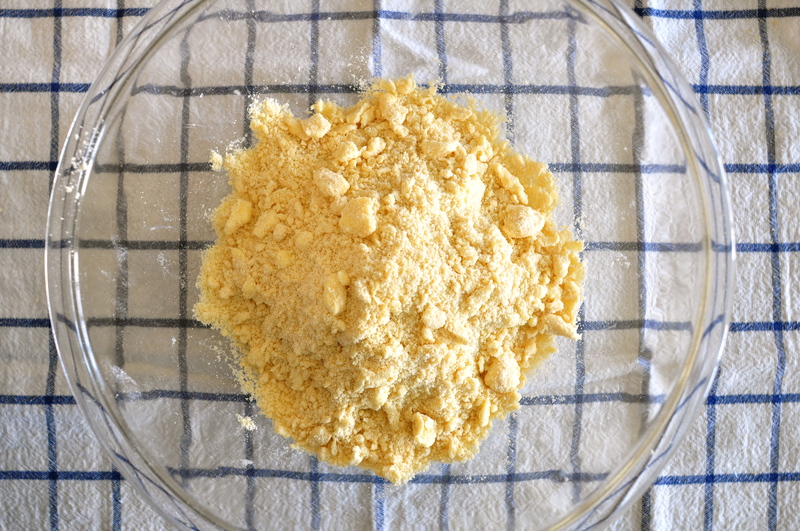 There are endless minute variations on pie crust recipes, some of which involve the size of the pieces of butter or the temperature of the ingredients. These do make a difference, and I think another crucial aspect is how the dough is treated. It should always be barely handled – delicately with the fingertips and never the palm of the hand. I think of it as the opposite of kneading. Place a small glass of water in the freezer. 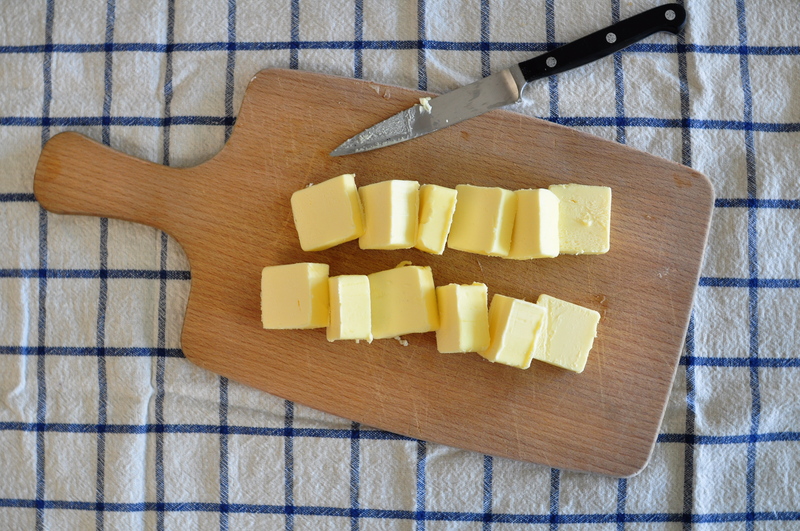 Cut the butter into 1/2-inch (1 cm) pieces. In a large bowl mix the flour, sugar, and salt. 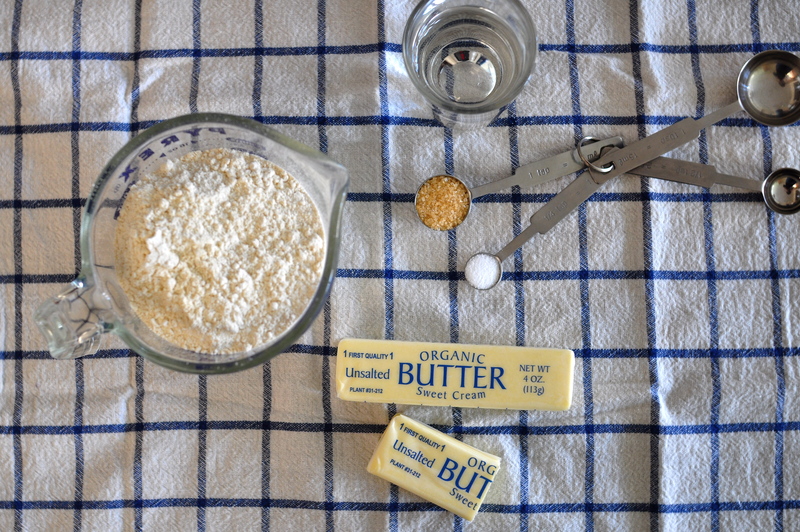 Gently work half of the butter into the flour mixture with fingertips until dough has the texture of coarse oatmeal. Add the rest of the butter and work it into the dough quickly, stopping as soon as the largest pieces of butter are the size of lima beans. Add the ice cold water, a few drops at a time, carefully bringing the dough together into a ball. Stop adding water as soon as the dough adheres, but some flour is left in the ball (the dough should not be sticky). Flatten the ball of dough, cover in plastic wrap, and refrigerate for at least an hour and up to 1 day. Remove dough from refrigerator and allow about 15 minutes for it to soften with the ambient heat and become easy to handle. Generously butter the pie pan. 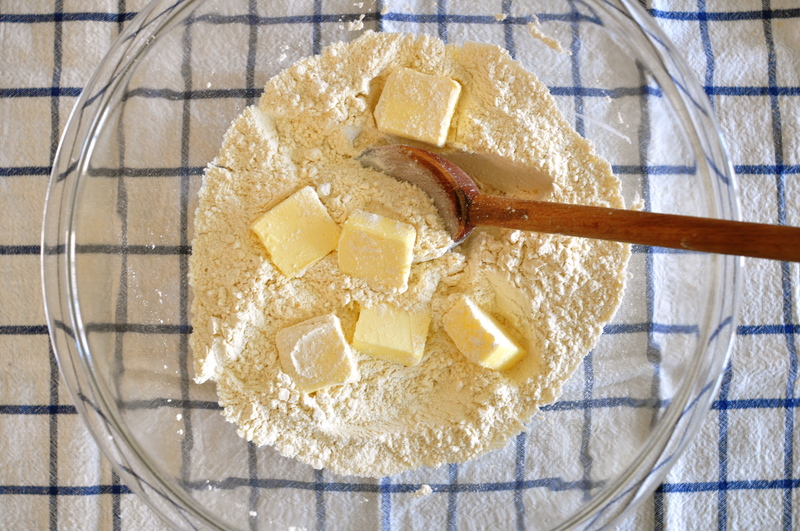 To transfer the dough to the pie pan, gently fold it in half once, then fold it in half again, and carefully place the folded dough in the pie pan, positioning the angle in the center. 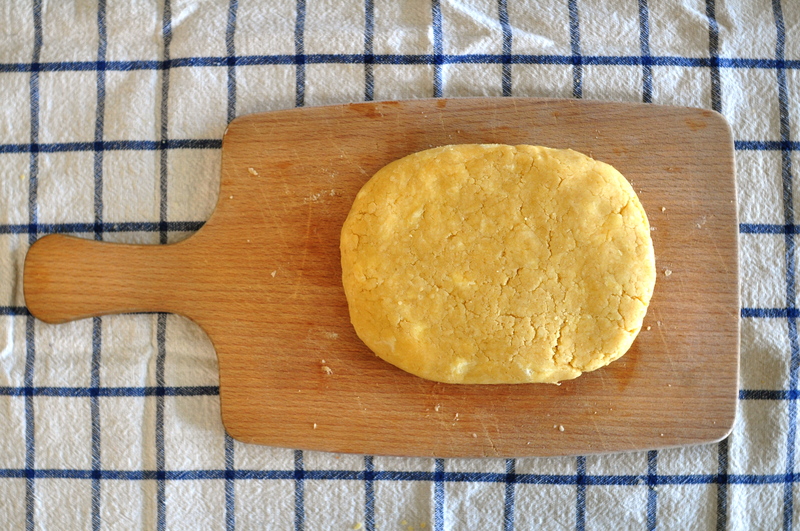 Unfold, press gently onto the pan and sides, and cut off excess dough from the edges. Slip the pie crust in the refrigerator for at least 1/2 hour before using. This entry was posted on 10 May 2011 at 10:52 and is filed under Basic, Thanksgiving, Year-round. You can follow any responses to this entry through the RSS 2.0 feed. You can skip to the end and leave a response. Pinging is currently not allowed.